William acquired the license of The Springwood Hotel c1870, whereby he acted as both publican and postmaster until the postal service was moved to the railway station c1880. In March 1882 he applied for an extension of the hotel license to enable him to hold a sports day and dancing on Easter Monday. He assured the bench that ‘only married people would be present’. The extension was granted without objection enabling him to open the hotel between 6am until 8pm. William was involved in July and August 1882, with several other Springwood residents (including Thomas Boland) in a proposed coal exploration scheme, and subscribed five pounds. However the scheme remained just that! 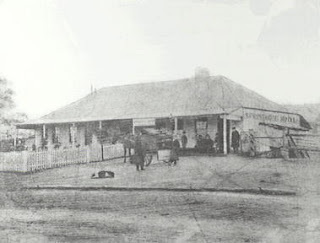 In 1883 a John Marsh applied for the license to the Springwood Hotel but the license was refused because of bad behaviour at previous hotels. The license remained in the hands of William. Mrs Martyn died in May 1884, casting a gloom over Springwood. A news article at the time said that she was beloved by all who knew her for her kindness of heart. It is uncertain when William died or if they had children.